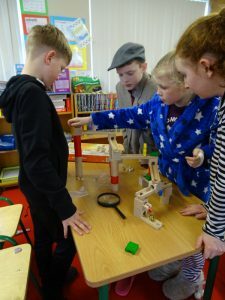 Pupils took part in engineers week 2019 completing different tasks and activities. Pupils learned about the work of different types of engineers from software engineers, mechanical engineers to civil engineers. Pupils in 1st, 2nd & 3rd class found out information about famous engineers, looked at some of the famous bridges from around the world and rebuilt them using matchsticks. The Lego challenge cards with different models to build were very popular. Pupils in the senior room designed, constructed and tested a marble run. 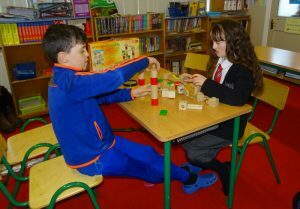 Pupils in the senior room were set a challenge in groups of creating, designing & building a model of a working lighthouse. Each team came up with a name for a lighthouse and some creative ideas from torches to working basic electrical circuits to light a bulb were used. All the finished models were very impressive, each with their own unique features. Pupils from the other 2 classrooms had an opportunity to go around to each group to view their lighthouse and ask questions about how they came up with their design. Take a look at some photos of the finished lighthouses below.